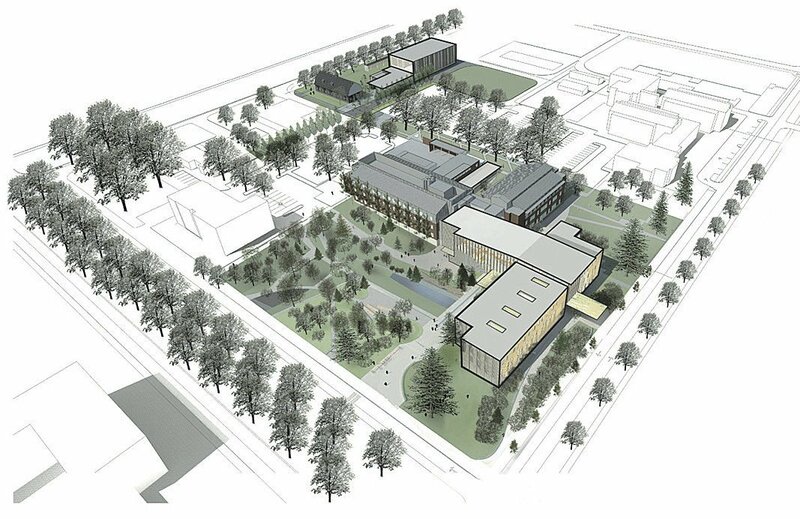 The new Peavy Hall and Emmerson Lab, both made of innovative Oregon wood products, will be the center of Oregon State University's Forest Science Complex. With the strong CLT beams in the background, “Rocking Wall” developer Arijit Sinha, left, and project manager Matt Sherman of Andersen Construction discuss plans for Oregon State University's new Peavy Hall with Geoff Huntington of OSU. The hall is due to open this spring. Corvallis, Ore. — Giant wood beams, hewn from ancient cedar, Douglas fir and pine, once braced Oregon’s largest homes and business buildings. But as the large trees disappeared from the market, wood beams were replaced with concrete and steel. Innovations in wood products and engineering have created support beams and panels even stronger than single old-growth beams, opening new markets for younger trees grown in Northwest forests. New cross-laminated timber — known as CLT — beams and panels, and related products, are finding their ways into structures that resist and recover from earthquakes, and can support the weight of a 12-story building. Oregon State University is putting CLT and other timber products to the test in its newest rendition of Peavy Hall, center of the university’s College of Forestry, which is under construction now. The building, due to open this fall, will showcase some of the latest uses of engineered wood, according to Geoff Huntington, OSU’s Forestry Center Director of Strategic Initiatives. CLT has been in use in Europe since the 1990s, and is catching on quickly in the Northwest. The engineered wood product features dimensional lumber glued tightly together in layers cross-wise to each other, creating panels that are both strong, resilient and flexible. A slew of recent scientific papers, some written by OSU foresters, applaud the material, claiming it is as strong as steel, more flexible, five times lighter, and made from a renewable resource. What’s more, the new products are creating jobs and adding value to younger trees. For example, Freres Lumber near Stayton, Ore., is now expanding its production to accommodate orders for their version of engineered wood products, called mass plywood panels. Wood products going into the new Peavy Hall’s construction were engineered, milled, and most likely grown, within 250 miles of the university, Huntington said. “The whole idea of this building is that it is a made-in-Oregon building,” said Thomas Maness, dean of OSU’s College of Forestry. The new products are not only stronger, but also, more convenient, saving money and time in construction, according to Matt Sherman, of Portland’s Andersen Construction. The CLT panels, manufactured by D.R. Johnson Lumber Co. in Riddle, Ore., arrive pre-cut to size and are bolted together at the site, making for quicker, more efficient construction. “It’s a game-changer,” said Michael Green, architect for the project. The support beams were already in place for the three-story building in December 2017. The panels and beams are part of the $65 million Peavy Hall’s unique “rocking wall system,” a wall-to-foundation connection that minimizes the impact of wind and earthquakes. Post-tensioned, self-centering rods run through the thick CLT walls and special U-shaped brackets. The rods attached to footings form a resilient design that allows walls to rock laterally during an earthquake, then rock back to their original positions, according to Arijit Sinha, OSU’s professor of renewable materials. The new 80,000-square-foot Peavy Hall will be part of the Oregon Forest Science Complex which includes the A.A. “Red” Emmerson Advanced Wood Products Laboratory. The Emmerson lab should be finished later in the year. Huntington said the lab will be the site of still more innovations in wood technology. Oregon State’s College of Forestry and the University of Oregon’s College of Design are wasting no time. The two schools have created the Tallwood Design Institute, which is currently assisting private investors on plans for the Framework Building — a 12-story “timber superstructure” in Portland that features support beams and panels made almost entirely of CLT wood. Construction is expected to begin this year. When completed, it will be the tallest wood building in North America, according to its designers, LEVER Architecture. A seven-story structure in Minneapolis, completed in 2016, now holds the record.